It goes without saying, but you should all be wearing sunscreen every single day, all year-round, even on cloudy days. We know it’s easier said than done and that sometimes sunscreen can mess up your makeup but there’s an option for when you can’t risk that but you desperately need sunscreen: setting sprays with SPF. They’re here to save your skin and your soul, darlings. There’s nothing worse than slapping on an impeccable face of makeup and then realizing you forgot to put sunscreen. Most of us just risk the burn rather than starting over, which is not great for your precious face. Especially with wedding season here — so many of which are in the baking hot sun (why is this always the case?) — you’re going to want to protect your skin. It also goes without saying, but setting sprays are great for multiple reasons: it keeps your makeup locked in, some products help hydrate your skin, and some of them cool your skin, which is what we need during the summer time. For the sake of saving you a nasty burn, sun damage, and helping you keep your makeup intact throughout the summer heat, here’s a list of 5 setting sprays with SPF. 1Supergoop Defense Refresh Setting Mist SPF 50, $28. We’re big fans of Supergoop in general, but are especially enamored with this refreshing spray, full of antioxidant-rich botanicals and sun protection that controls oil, shine, and helps improve skin’s complexion. 2COOLA Makeup Setting Spray SPF 30, $36. This organic makeup setting spray reduces shine, refreshes UV protection, and keeps makeup looking fresh. 3Pixie by Petra Sun Mist, $18. Contains SPF30-40 depending on how thorough the application, works to minimize uneven areas and balance your skin. This sheer and lightweight broad spectrum sunscreen is not greasy and protects you all day long. 4Kate Somerville UncompliKated SPF 50 Soft Focus Makeup Setting Spray, $38. This fine-mist setting spray delivers broad-spectrum SPF 50 sunscreen protection that absorbs oils and fights wrinkles as well. 5Amorepacific Resort Collection Sun Protection SPF 30, $32. 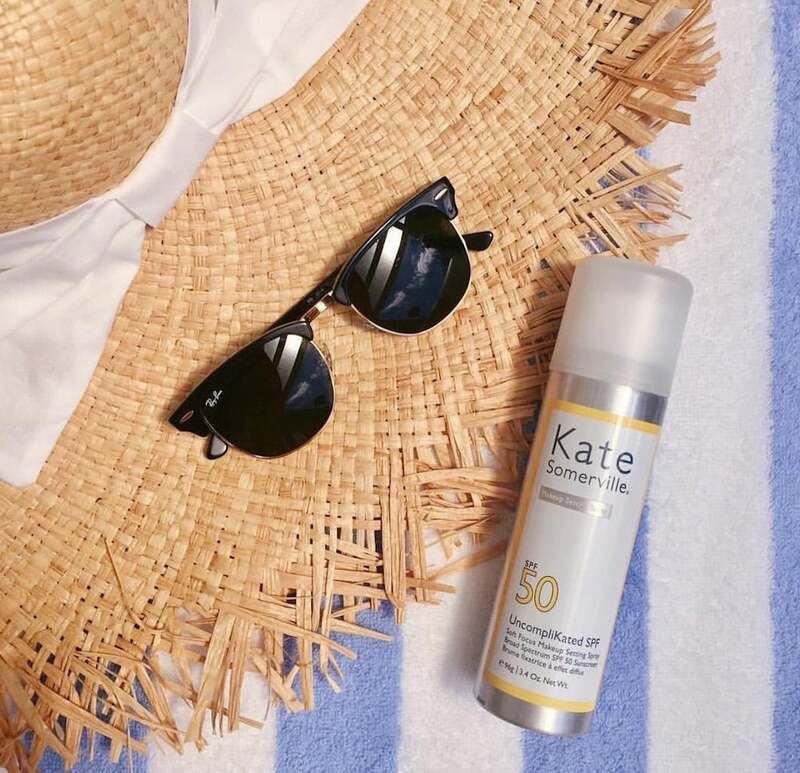 While not explicitly a setting spray, this sunscreen spray is so lightweight that it settles over your makeup in an even layer of soothing protection and hydrates sun-exposed skin. It’s definitely a niche market, but they’re out there and ready to make your lives easier. Whenever possible, you should definitely wear regular sunscreen under your makeup and then use your setting spray as a refresher throughout the day. But if you’re ever in a pinch and desperate, these are a great solution for keeping your skin protected.